When Mrs. MM and I lived in Singapore, we would probably have Hainanese Chicken Rice once a week at one local place or another. It was one of our favorite comfort foods in the island city. It was so good and so cheap at hawker stalls, restaurants and mall food courts, that we never bothered to learn how to make it ourselves. Over the years, we have tried several versions at home, but all of them were just too cooked, not reminiscent of the barely poached chickens in Singapore, that today, might give the bird flu concerned hypochondriacs the hibbie-jibbies. I once overheard that some places just stuck the chicken in a pot of just barely boiling water, then immediately turned it off and let in sit in the hot liquid for several hours until it was cooked through. Somehow, that didn’t seem to pass the health department or FDA standards for food preparation. But it would explain the incredibly tender chickens with slightly red blood near the joints/bones. So last week while I had the food channel on, I spied Kylie Kwong preparing her version of a poached chicken with a ginger soy sauce and it looked incredibly simple and easy, so I decided to try it the next day. Honestly, I thought I still overcooked the bird, probably because our chickens tend to be so much smaller than Australian chickens, so I suspect shortening the simmering time by 10-15 minutes would do the trick the next time around. 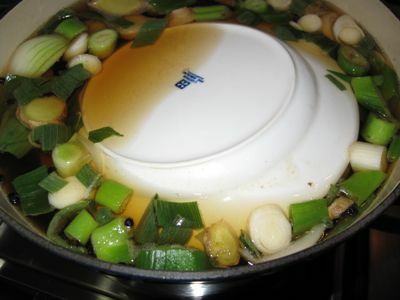 First i prepared a poaching liquid water, several cups of Shaoxing rice wine, some soy sauce, sliced ginger, green onions, peppercorns, white onions. I brought this to a boil, added a whole chicken (try to get a big one if possible), breast down, and brought the liquid back to a very gentle simmer, not a boil. Cover the chicken with a plate to hold it down in the poaching liquid. Simmer for 40 minutes (30 minutes would be sufficient for smaller pinoy chickens), turn off the heat, and leve the chicken in the liquid for another 2.5-3.0 hours. After the long soak in the poaching liquid, remove the chicken and chop it up “chinese” style, with bones and all. Next make a simple sauce by chopping or julienning up some fresh ginger, add a touch of poaching liquid, some light soy sauce, a little sugar, a hint of sesame oil, then heat up several tablespoons of peanut oil and dump it over the ginger and listen to it sizzle for a few seconds. Pour this over the poached chicken and garnish with some cilantro. On its own, this was a bit blah. But paired with some kecap manis or sweet soy from Indonesia or Malaysia, and some sambal or chili sauce, and some pickled Singaporean chilis, this was pretty darned good home-made chicken comfort food. Next time I have to add some of the poaching liquid to half cooked rice so that it is infused with the same flavors… Yum. I can taste and smell the ginger all the way to here. Looks doable and healthy to boot. I’ll try this out one of these days. My family loves this dish, and we have it nearly every week, but I confess, not homemade. Cafe Asiana at The Palms Country Club has all-you-can-eat Hainanese Chicken as part of it’s Singaporean buffet every Thursday. Chef Hans claims this as one of his specialties, I should corner him one of these days and ask for the recipe! Poaching makes for good, tender chicken, but it has never caught on with my family. May be because it’s too pale; we’re used to the “browned” kind. Whatever. Personally, I think poached chicken tastes good – not to mention that you save on gas! There is nothing like Hainan Chicken. We tried this recipe http://www.malaysianfood.net/recipes/recipehainanchicken.htm and it made for a good first effort. I still love the way my mom made it though but she can never give me a recipe i can follow. Good choice for healthy eating! Sounds like a cardiologistâ€™s recommended diet. BettyQ graciously shared her Hainanese Chicken Recipe in one your featured articles and it was my blueprint followed it word-for- word including dipping sauces and the punctuation marks! Now it is imbedded in my head and can cook it without the recipe in front of me. I rate it as like the one they serve in Singapore either at the food courts or restaurants and enjoy it at the comfort of my home! The downside is I have to do all the work including the clean up! 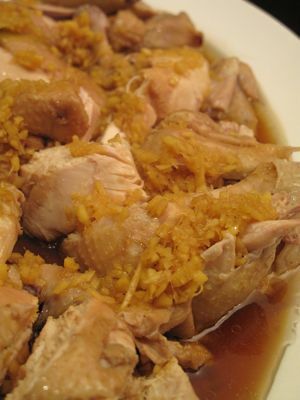 Recently, BettyQ generously shared her Chinese arroz caldo which is leftover of the Hainanese Chicken. It is shooting two birds in one stone – same substance different format. My million thanks goes to you MM and BettyQ! MM, off topic – last night (maybe for 6 to 8 hours) I can’t get into your website. There was a message your site was temporarily unavailable. Was worried – whatever happened to my favorite site? Am I glad you are baaaackk!!! Wooow! HCR is my favorite dish in the world! It was all I ate for lunch for nearly two months when I lived in KL. Thanks marketman! I’ll bookmark this recipe to try it when I’m back in Pina. I remember there was always a neat bundle of fresh coriander leaves with the HCR I ate, I loved to chew on it after eating HCR, natural breath mint! whew – i thought something happened to the website yesterday. (something did happen??) glad you are back with delicious recipes and lovely flowers! 1 whole chicken, 10 bowls water…simply bring water to boil in a pot – adaptation is adding a small bundle of pandan leaves, a thumb of ginger and a whole onion, saw this done at the hawker – put chicken in, then wait for water to boil again, switch off heat and leave chicken for 25-30 minutes. remove chicken and plunge in cold water, leave for 30 minutes, then drain chicken. adaptation – also saw being done at hawker – rub chicken with sesame oil all over and hang dry. sauce – 90 ml chicken stock, 2 Tbsp oyster sauce, 2 Tbsp light soy sauce, 2 Tbsp sesame oil, 1 1/2 tsp sugar and 3 tsp shallot oil. just mix all. chop chicken and pour over the sauce. there should be a bed of seeded and sliced cucumber at bottom of the plate, then over the chicken some coriander and spring onions on top. chichen rice – 450 g uncooked rice, rinsed, 1 Tbsp chopped garlic, 1 Tbsp chopped shallots, 1 Tbsp cooking oil, 10 cloves garlic with skin on, 1 bunch pandan leaves; rice seasoning – 700 ml chicken stock, 1 tsp salt, 3 Tbsp ginger juice ( grate ginger and extract juice), 1 Tbsp chicken powder (comes in small bottle or can). heat oil, fry shallots and garlic until fragrant smell, add rice and stir until all is coated with oil, pour mixture in a rice cooker, add seasoning, whole garlic and pandan. cook until done. also from jimmy chua cookbook: chicken rice chilli sauce…90 g red chilli (sili haba), wash and dry, 15 g garlic, skin removed, 50 g ginger, skin removed, 1 tsp salt, 1 tsp sugar, 60 g lime juice, 50 ml chicken stock. blender chilli, ginger and garlic with stock until paste. add other ingredients and stir well. i actually make another ginger sauce by grating young ginger, juice extracted for the rice mix, then add a sprig of chopped green oinions, a pinch of sugar and salt, then heat sunflower oil until smoking and pour over the grated ginger. of course, eat with dark sweet soy sauce. Does blah mean it was bland for you? Did you leave out salt from the poaching liquid? Is the “saltiness” of soy sauce enough? Or, as in Hainanese chicken, is the dish really left bland because you have to eat it with dipping sauce and other condiments? The idea of using some of the liquid to cook rice is a good one. Thanks for the recipe and instructions on how to make Hainanese chicken rice. Would love to try this. In an old episode of No Reservations, the boiled chicken was plunged not only in cold water but directly onto crushed ice. mimi, thanks for the recipe. have saved it. bettyq, may I have your version too? my email add is corrrine_p@yahoo.com (triple “r”). I need to limit my diet to chicken and fish and am on the look out for good chicken recipes. thanks! Corrine: do you mind just going to MM’s post early this year? He was sooooo kind enough to index the recipes I have shared…the Hainanese Chicken is one of them. Maraming Salamat. MM!!!! However, you can ask Alilay or Maria Clara…I don’t think this is DIET FOOD! Why? Because it is soooooooooooo MAKANIN!!!! esp. if you eat this with the Hainanse Chicken flavoured rice. Trust me on this one! What did you do with the poaching liquid, MM? If you still have it, you can use the same poaching liquid…boil it till reduced in half, add some star anise, a cinnamon bark, some dark soy, palm sugar or demerara sugar (to taste), some softened Chinese mushroomsand then add either Pata or Duck…then BRAISE IN YOUR PALAYOK!!! !…and you have either Pata TIM or Pato Tim. To serve, steam shanghai bok choy or baby bok choy. 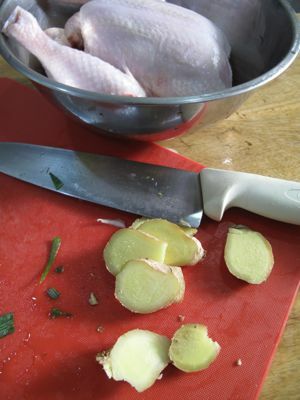 Then cut the pata or pato in serving pieces. …the sauce, could be thickened with tapioca starch or corn starch and coat the meat with it. Spoon over the vegetables. Don’t forget to serve the chinese mushrooms with it. oh, I forgot…have to have a few pcs. of dried tangerine peel to the braising liquid if making PATO TIM. Wow seems almost everybody loves hainanese chicken,me I love it too. How abot “bakuteh”? Anybody knows what are the ingredients of this fare?Maybe MM and Betty Q knows? Isabella: is it the one with the dried bean curd sticks and mushrooms,too and with pork or beef brisket? If it is, I like that, too!!! Let me know if that is the one you are talking about. But the dipping sauce is different…made with those really salty bean curd squares and a bit lemon-y? If that is the one, I will gladly tell you how to do it! I once made HCR for a big family gathering and everyone ignored it except my siblings! OK, so we grew up together and have the same taste in food. It was pretty darn good. Tender chicken all sliced up and ready to dip in ginger sauce (with sesame oil, spring onions & salt) and a hoisin dip. Perfect with the tasty but not overpowering rice (I used the poaching broth). Oh, and for a bit of change, I also had tortillas and shredded lettuce on hand. hi mr. mm, that really looks a very good and tasty variation to hcr. i wonder po, would you have recipe for bah ku teh? tasted it once long time ago and i remember na sarap na sarap po talaga ako. however, i couldnt figure out how to replicate it. even the packed bahkuteh mix can’t capture the taste i remember. thanks po. bettyq: i made your hainanese chicken recipe, it was really good and my kids enjoyed it. medyo pumalpak lang ako sa dipping sauce because i used rock salt, so th salt wasnt evenly distributed in the mixture. i also added other veggies as sidings, like baguio pechay, cucumber and fresh tomatoes so they’d meet their vegetable allowance for the meal. also made your siomai recipe, this time without deviating from the receipt. kakaiba talaga ang lasa sa nakasanayan na na sa fastfood. i have it now as regular go-to dish sa ref. i also made the chicken version since its lent and hubby’s panata is not to take any red meat. made the lemongrass chicken coating, kaso the lemongrass we had were very young so there werent enough white part. used the green part also but yung base part lang. when they were ground together, it looked and smelt like curry paste. the recipe i did wasnt exciting for the kids, asked them if they’d like to have it next time, they just shrugged their shoulders. but i’ll try it again and will look for more mature tanglad. thanks for your generosity po. godbless! Not sure if you’ve seen NR Singapore when AB visited some hawkers place somewhere where they serve some special Shark Head meal. It also showed how they cook Chicken Rice, where they put the chicken in a big bucket full of water with ice after boiling the whole chicken. Could it be the dunkin’ the whole chiken in that ice cold bucket that makes the chicken that tender? Filipinos should really try to venture around Little India, we’ve noticed that most Filipinos would shun this place. Ummm..I love chicken Rice. I agree that Singapore has a lot of these.When visiting my daughters who live there I always have some. My version of chicken rice came from a friend who lived in Brunei. 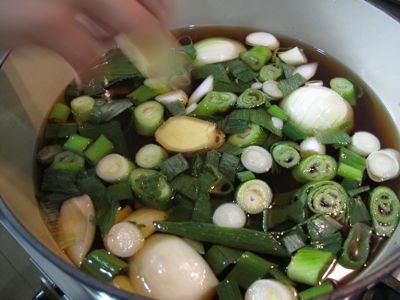 The chicken stock uses the yellow luya called dilaw. Of course,the rice is cooked in the chicken stock which was used to cook the chicken. When I make several of these chicken,I wipe the chicken with sesame oil to retain its color. So easy to make and so delicious. Still looks healthy eating to me…. but you don’t eat it with dipping sauce it is like a pork rib soup that Mlaysian and Singaporean eat for breakfast with Chinese crullers. Lava Bien: Dunking in cold awater after poaching…one, to stop the cooking process….2. in doing so, the MOISTURE IS RETAINED, not so much affecting the tenderness of the chicken. it is already cooked by poaching it. Furthermore, the chickens have to be ready for consumption as soon as possible esp. for the hawkers. So, dunking in cold water would speed things up for them. Then hang to dry….for visual aesthetics…so the skin remains intact when they sell it. Lava Bien: I actually searched for and got to eat at the hawker stall that AB ate in. It’s called Tian Tian. I even got a picture in front of the stall with Mr. Tian himself in the background. I already got AB’s itinerary in Manila and Pampangga. Can’t wait, I’m so excited!!! The dunking in an ice bath has something to do with sealing in the juices which is why the chicken remains tender even after it’s hung for quite sometime prior to serving. The “proper” (well…I don’t know if this way is ‘proper’ or just ‘long’) way to do HCR is to do successive poaching/blanching. You’ll see HCR places in Singapore with a series of pots of water in the kitchen. dunk chicken in boiling water…when the water comes back to boil, dunk it in cold ice water to cool. Then dunk it again in boiling water until the the water comes back up to boil….then back to the cooling bath. Repeat this process until the cooking time adds up to 45 mins. I don’t know what this process actually does to the chicken, but I know that the best HCR I have had was done this way. I hypothesize that by not allowing the chicken to actually boil, the process preserves moisture because the proteins don’t bind up too much to expel the water held within. Sounds like what my mom used to put together-‘patalbog’, as she called it- and always good! Hello Isabella: Ok…I asked my Malaysian neighbour and she described it as something MIL makes and my hubby grew up eating….I didn’t know that was Chinese version of Bakuteh. I will ask her to write down the herbs and spices she uses and have it translated. Neighbour told me though that you could buythe prepackaged spices in Asian stores. Had I known earlier that it was the soup that MIL ALWAYS makes for us to take home each time we visit her, I could have asked to wait for me before she started making it! Chris…I much prefer the shrimp shau mai or seafood shau mai. I think you already sent me your e-mail addy. Please send it to me again so I can send you the shrimp shau mai. That one I can stake my life on it that your hubby and kids will like IF they like shrimp or prawns!!! Thanks for finding time to research for bah ku teh…it is a very delicious soup…that still lingers in my taste buds memory,I had tasted it…during my sojourn i Brunei.It is really delicious! I am waiting for your next blog about the ingresinets and how to do it.! this is one of my absolute favourites… i’m not a fan of Kylie Kwong’s recipes though… i think, this is one classic dish that should just be kept that way… the NR Singapore episode showed how this is “traditionally” done. In my opinion the classic way yields the best result… the beauty of this dish is in its subtlety. i am also an hcr addict! this was my staple food when i lived in singapore having it for lunch and dinner almost everyday! i used to get my hcr fix here in manila at cavana but they closed shop end of 2008.
i still haven’t found a replacement but i once saw a small resto in malate near robinson a while back. don’t know if it’s still there or if their hcr is good. If I remember correctly, they also said in NR that dunking the boiled chicken in ice water also allowed the skin to separate from the meat. 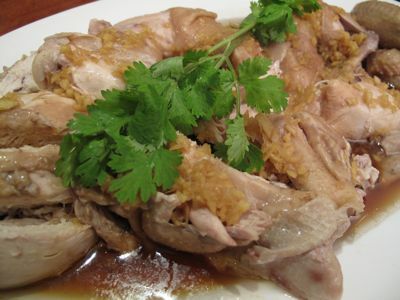 Hey Chris: do your kids eat the skin of the Hainanese Chicken? If your kids are like my kids, they remove the skin or they won’t eat it. So I have resorted to making chicharon oout of the skin. Though it is really flavourful and taste really good, it is deadly (cholesterol! ), and then even deadlier…if you mix it in the mashed potaoes with caramelized onions. if you guys have a salad master wok or something similar. just put the chicken on it breast down on a bed of ingredients (Onion, garlic, ginger, and sea salt). Just put a bit of water only about 200ml cover it and simmer it then turn off the fire after 30 mins and let it stand there with cover for another 30 mins. Then cut it up in pcs arrange in a plate with banana leaves drizzle with sesame oil and serve with cilantro, spring onion, cut cucumbers and tomato. You will have the best tasting hainanise Chicken Rice that is fully cooked to the bone. For the Rice use the stock collected from boiling the chicken, if you use salad master you’ll be surprise with the amount of liquid and the concentrated chicken stock that was generated and it is really very good. The best is to pound the garlic, onion and ginger from the stock or pulse it in a blender (save a bit of stock, garlic, onion and ginger for dipping sauce later) then saute the rice with it with the chicken stock then put it in your rice cooker add water and in 30 mins you have a nice chicken rice. For the dipping sauce…use the saved garlic, onion, and ginger from the soup add fresh one if it is not enough then pound it on your mortar and pestle together with red chili (If you want less spicy use the big one). This is my secret!!! once you are done with the pounding add a bit of stock, pinakurat vinegar and dayap. Serve the chicken on banana leaves with the tomato, cucumber and cilantro and spring onion. Yummmy it will definitely beat all the hawker chicken rice stall :). If you have native chicken it will be the best!!! oh by the way massage your chicken with sea salt.. Thanks dude! Tian Tian it is , amma check it out on my next stop there, been there a few times but haven’t tried their chicken rice and chili crab heheheh. Sop Butot, or anything mutton is what I eat when I’m there as I do not usually eat here in the Bay. fudcrmnl did get the chance to try their Shark Head? Hey Jun….Thank you for sharing your Singaporean style! I cannot wait to try it esp. your dipping sauce. Boys will be confused now…sooooo many dipping sauces! Oh, Jun…before I learned how to make this Hainanese Chicken, we used to frequent this hole in the wall place that serves nothing but this chicken, Malaysian Sate and the best Malaysian Curried Chicken I have ever tasted! They serve this HCR with pickled daikon, carrots and cucumber (achara). Is that how they serve it there too in Singapore? Chris…the lemongrass paste is sort of concentrated…redolent with the lemony essence with a hint of 5 spice. That is why the proportions I gave you is enough for 2 pounds or 1 kg. of boneless chichen thighs. It may not seem a lot but you only use a few tsp./ chicken thigh. However, once you have rubbed it on the chicken and have allowed it to sit for a few hours, the flavours will mellow. IT IS BEST TO BARBECUE the chicken preferably using boneless thighs. Did you barbecue it or pan fry? Normally chicken rice here is served with cucumber and tomato garnish with cilantro and spring onion. The chicken is sprinkle with light soya sauce and sesame oil. Achar as what they called it is normally served on chicken/mutton briyani. Although some peranakan, indian and malay eatieries serve it on anything you order together with rice. slightly off-topic, but this is also about chicken…have you seen this? hi bettyq! sending you an email right away, lol! the shrimp siomai sounds yummy… i remember tuloy the hakao served sa golden fortune ongpin, freshly made as you order… sarap. as for the lemongrass chicken, i used the thigh fillet and barbequed them on charcoal grill. jun, i cant wait for my dad to send over the hand-me-down salad master. mas masarap talaga magluto using it bec. it seals in the flavor and very concentrated pa.
Bak Kut Teh (Pork Bone Tea Soup). Here’s what I can share with you. Down here in Singapore a pre-packed Bak kut teh is readily available in any supermarket or convenience store. I am assuming you can’t find any on your side and you want to do it from scratch. Heat up a claypot of water until it boils. Add in the 3-4 head of garlic, pork ribs, mushrooms and Bak kut teh spices wrap in muslin cloth. simmer in low heat for about 1 – 2 hours until the prok ribs is tender. Add in the seasoning and boil for another 5 minutes. Serve hot with white rice. jun, thank you very much for the recipe. kaya pala di ko ma-place ang lasa niya because of the many spices in it. again, many thanks and godbless! A relative who has a lechon manok chain used to sell a lot of the chicken skin chicharon.We loved it. It’s lethal bettyq….I don’t want my kids to have high blood early…hahaha…so delish but so baaaaaaaad……..Dont want to cook that na….. Thanks, Jun for your Malaysian or Singaporean Bak Kuh Teh. It is different from the Chinese one. Besides the spices and the usual stuff in it, I have seen MIL’s soup with sea cucumber and dried longan and pieces of what looks like bark and ginseng and those little red berries that looks like puffed pinipig only they are reddish! hi betty q, actually each shop here have their own spice mixture. some Singapore coffee shop just do it with white pepper and garlic head. Malaysian bakuteh have more spice and darker in color. Parang adobo rin natin everyone has different preference. are you referring to Chinese wolfberries that are commonly seen on their steam soup. when I went to Nanjing china I see them everywhere parang grass Lang sya even on the streets side mayroon. I wonder if this can be done in a crock pot? I think I know what is for dinner tomorrow. Will let you know how it turns out. WHERE CAN YOU BUY THE SHAOXING WINE? tHANKS. my father used to do this recipes when we are in baguio because of its spicy taste .